Antoine Cassar is not the kind of writer given to autobiographical works. He has written mainly about language, maps and borders, and not about what happened to him. 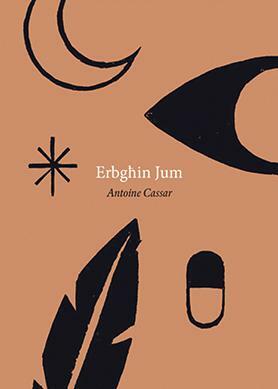 That separation, however, has seemingly been set aside with his latest poetry collection entitled Erbgħin Jum, a journey in which he addresses his own childhood trauma through the motif of walking. The 40 poems in this collection can thus be consid-ered Cassar’s autobiographical poetic performance. Each of the daytime poems in Erbgħin Jum narrates a walk. The ancient practice of walking functions as a driving force for creation. Various authors in the history of literature have utilised the practice of flȃnerie as a creative research method, ranging from Jean Jacques Rousseau to Virginia Woolf. Likewise, Cassar’s walks become an exercise in sensation and perception, making anything and everything possible, thus enabling him to shape his reflections into writing without fear or restraint. To create his poems, Cassar did indeed negotiate the landscape of his own childhood trauma: “It was time to confront my own monsters, before falling unawares into the cage of genetic determinism and becoming a monster myself.” There is a sense of pilgrimage, not in the traditional sense, but of a modern traveller who faces upheavals, doubts and struggles. The poems retell moments in his childhood, but function on a metaphorical plane. The style of writing is personal and contemplative. One of the initial poems is written in terms of the Pater Noster. In his rewriting of the prayer, however, Cassar addresses his own father rather than the Lord, condemning instead of praising him, pointing a finger of accusation rather than venerating him. His anti-prayer thus becomes an ingenious means to externalise his contempt towards his abusive father. The poems become his own battlefield. He is neither living nor dead. On his poetic panel, he depicts human suffering and punishment, suicidal thoughts, nightmarish visions, insomnia, self-torturing thoughts, illusions, greyness, a sense of guilt, an old eight-year-old boy who goes mad. At poem 34, however, his creative proficiency is somehow self-arrested. As Cassar states, it took him two years to complete the last six poems. Here, at poem 34, the poet has reached a place encapsulating the disorientation and ambiguity that occurs at a threshold. This place, however, holds a potential for transformation, a space where a new reality can be born. Cassar accepts the invitation to surrender to something larger than self and undergoes a process of valuable transformation. Inside this threshold, Cassar experiences his realisation and coming-to-consciousness. Gradually, the veins are purified and the poet succeeds in transforming pain into his own poetic kingdom. The Maltese language has its own cathartic function for the poet. Through his childhood experiences, Cassar had come to associate it with the language of domestic violence. Because of this association, it is also very significant that Cassar decided to write these poems about his childhood trauma specifically in Maltese, thus redeeming his relationship with the language. The way the content is illustrated is worth a mention too. Steven Scicluna’s eight ‘stations’, printed from woodcuts, complement the poems. The totemic illustrations function as powerful symbols of childhood trauma in a mystical vein. They allow the reader to fill in the dots and create their own mystic narrative. Art can indeed provide a cathartic experience for its creator, as the suffering artist can somehow transform that suffering and make poetry, in this case, the very instrument of his personal catharsis. Erbgħin Jum bears witness. Through the very personal act of writing poetry, and of transforming mortal pain into immortal art, Cassar completes his path to redemptive catharsis. Ultimately, were it not for the creation of these poems, Cassar’s purging of his inner turbulence may not have been possible.